Mistra EviEM | SR2 How effective are wetlands for nitrogen and phosphorus removal? 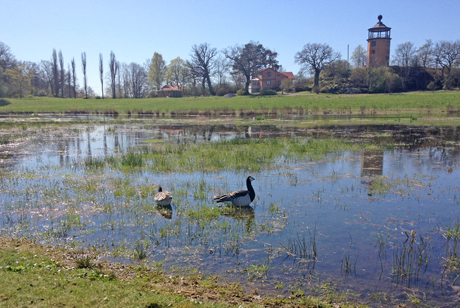 Constructed wetland in the Bergius Botanic Garden in Stockholm. Photo: Magnus Land. There is widespread agreement that wetlands can remove nutrients from water flowing through them. Knowledge of the removal processes and of factors influencing the efficacy of wetlands as nutrient traps is also fairly extensive, but the large variation in earlier measurements has made it difficult to assess how efficient the wetlands actually are. EviEM has therefore reviewed the available evidence on this subject. Eutrophication – the over-nourishment of fresh and coastal waters from detergents, fertilizer or sewage – is known to occur in large parts of the world and may result in algal blooms and oxygen deficiency. A widely used method to reduce the input of nutrients to freshwater and marine environments is to let water from, e.g., agricultural fields and wastewater treatment plants, to pass through a created or restored wetland. Subsequent to consultations with a wide range of stakeholders, e.g. the Swedish Board of Agriculture and the Swedish Agency for Marine and Water Management, EviEM initiated a systematic review of the ability of constructed and restored wetlands to remove nutrients. The review is being conducted by a team of subject experts chaired by professor emeritus Wilhelm Granéli, a limnologist at Lund University, Sweden. We reviewed approximately 6000 scientific articles and other reports. All papers were screened with respect to relevance, and the relevant papers were critically appraised. Data from 92 articles, containing 203 wetland studies, were used in the final analysis. Our systematic review shows that the removal efficiency on an annual basis (i.e. the annual relative load reduction) is generally high for both total nitrogen (TN) and total phosphorus (TP). We have also examined the removal rate in absolute numbers per unit of wetland area. The removal rate much depends on the loading rate; generally, the more nutrients that enter the wetland the more nutrients are removed. Wetlands receiving secondary treated wastewater removed TN more efficiently than wetlands receiving tertiary treated wastewater. Restored wetlands directly located on former agricultural soil removed TP less efficiently than other wetlands. Wetlands where the hydraulic loading rate (water flow rate per unit of wetland area) was driven by the amount of precipitation removed TP less efficiently than wetlands where the hydraulic loading rate was controlled. The removal efficiency for both TN and TP generally declined with an increasing rate of average hydraulic loading. However, TN removal efficiency generally increased as mean annual air temperature increased, whereas TP removal efficiency generally rose in line with increasing TP concentrations at the wetland inlet. Restored and created wetlands remain appropriate and potentially sustainable ecological engineering approaches for removing nutrients from treated wastewater, lake and river water, and urban and agricultural runoff. The systematic review supports the view that created and restored wetlands are most efficient when they are placed where the inlet concentration of the nutrients is high and the hydraulic loading rate is reasonable low. A final report on EviEM’s review was published on April 20, 2016. Results have also been published in a popular summary and a fact sheet (see links to the right). The review team met for the first time in early December 2012. From left to right: Anders Grimwall, Jos Verhoeven, William Mitsch, Carl Christian Hoffmann, Karin Tonderski, Magnus Land and Wilhelm Granéli. Photo: Claes Bernes.